Ever wonder what it would be like if we had to fight the Vietnam war in underground caves against enemies who use deadly tactics they learned from watching the Three Stooges? Sure you have! And that’s why you need to watch our latest episode from last week! Yes indeedy, Episode 27 of Doc Mock’s Movie Mausoleum is now permanently archived online for your viewing pleasure! Big thanks again to our special guest Jim Woods for joining in all of the underground undulating of episode twenty-seven and then hanging out with everybody in the chat rooms at the end of the show! Also, be sure to enter the special Paul Scheer art contest! Episode 26 With Toby Huss Now Online! Ever wonder what it would be like to survive a nuclear holocaust as gay Batman only to be relentlessly hunted by a gang of rapists? Sure you have! And that’s why you need to watch our latest episode from last week! 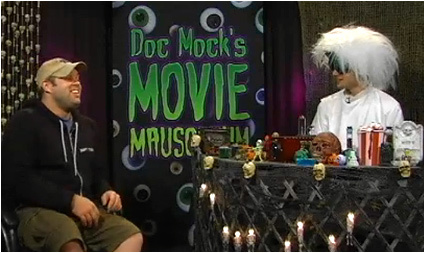 Yes indeedy, Episode 26 of Doc Mock’s Movie Mausoleum is now permanently archived online for your viewing pleasure! Big thanks again to our special guest Toby Huss for joining in all of the nuclear nonsense of episode twenty-six and then joining us in the post show! Toby is an incredibly talented performer who has appeared in Carnivale, Reno 911, The Adventures of Pete & Pete, Seinfeld, King of the Hill, World’s Greatest Dad, and much more. If you have the means, you should definitely check out his “Rudy Casoni Variety Show” at the Steve Allen Theater in Los Angeles and pick up his hilarious “S’no Balls” Christmas CD online at cdbaby.com. New Contest For Artie, The Strongest Man In The World! Enter This Week! We’re holding a new contest this week and I’d really like all of you to participate. Why? Because, if you’re a fan of The Adventures of Pete & Pete, you’ll be excited to hear that Artie, the Strongest Man in the World will be viewing each and every one of your entries! 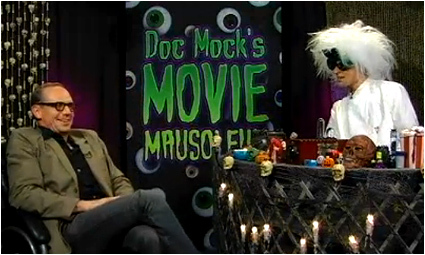 Yep, the one and only Toby Huss is going to be our guest on Doc Mock’s Movie Mausoleum this Friday night! So lemme explain the contest. First off, you do NOT have to be a real artist to participate in this. It doesn’t matter if you want to draw it in Photoshop, MS Paint or even with finger paints… we’ll be judging these entries solely on creativity and humor, not artistic talent. 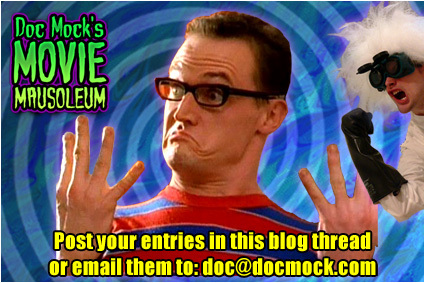 So, to enter the contest, all you need to do is draw Artie interacting with the cast of Doc Mock’s Movie Mausoleum in any way you see fit. He could be saving them from danger, he could be enjoying a snack with them… whatever comes to your mind really. Once you have your entry created, simply post it here in the official contest blog thread or you can email it to me. Make sure your entries are turned in no later than 5pm PST on Friday, February 12th. If you turn them in any later than that, I can’t guarantee they’ll make it onto the show. Lastly, if you’re a fan of any of Toby’s other characters, including “The Wiz” from Seinfeld and “Stumpy” from CarnivÃ le, you’re more than welcome to submit entries involving them as well. And yes, feel free to enter as many times as you like. After you’ve turned in your entries, just kick back and watch the live show on Friday night at 10pm PST and we’ll be displaying any of the entries that were submitted and letting Toby comment on each of them! A winner will then be selected to receive an autographed poster! I wanna see entries from all of you guys whether you can stay up and watch the episode or not. After all, you can always see what Toby had to say about your entries in the archived version of the show. Alright, so you’ve got all week to churn out some great entries involving Artie, Doc, Miss D, Licky, Smiley and anybody else you’d like to include, so get crackin’ on ‘em. Good luck to all of you who enter! Pipe! Ever wonder what it would be like to chop off your legs, study martial arts and head up a drug smuggling cartel? Sure you have! And that’s why you need to watch our latest episode from last week! 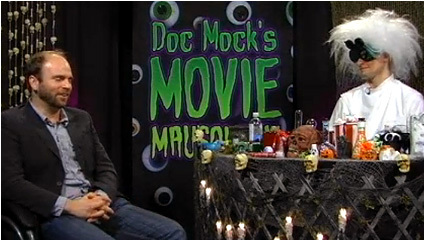 Yes indeedy, Episode 24 of Doc Mock’s Movie Mausoleum is now permanently archived online for your viewing pleasure! 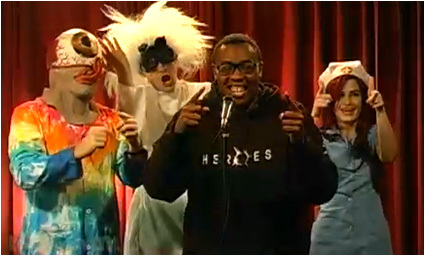 Big thanks again to our special guest Joel Spence for joining in all of the weird-wheeled wushu of episode twenty-four and sticking around in the chat room with us for some dancing and other antics afterwards!